Shirley Hardie Jackson was the acclaimed author of "The Lottery," a short story published in the New Yorker. In her short lifetime, she also wrote "The Haunting of Hill House," which was adapted into the movie "The Haunting," and numerous other short stories and novels. 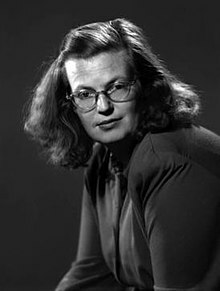 Shirley Jackson was born in San Francisco, California in 1916. She and her family moved to New York State when she was a teenager, and Jackson graduated from Syracuse University in 1940 with a Bachelor's Degree in English. While at Syracuse, she was fiction editor of "The Syracusan," a campus humor magazine and founded "The Spectre," a literary magazine with future husband Stanley Edgar Hyman. In 1941, Jackson had her first short story published, "My Life with R.H. Macy," in The New Republic. The couple moved to North Bennington, Vermont in 1945, so that Hyman could take a teaching position at Bennington College. Jackson's writing career took off in 1948, when the New Yorker published her short story, "The Lottery," which describes an annual gathering where the inhabitants of a small town select one of their own to be stoned to death. Jackson wrote several other novels including "Hangsaman" (1951), "The Haunting of Hill House" (1959), and "We Have Always Lived in the Castle" (1962) and had pieces published in Mademoiselle, Fantasy and Science Fiction, Charm, The Yale Review, The Saturday Evening Post, and Reader's Digest. She also wrote two books about raising her four children, "Life Among the Savages" (1953) and "Raising Demons" (1957). Jackson died on August 8, 1965 at the age of forty-eight. Posthumously, her works have been collected into "Just An Ordinary Day" and "The Magic of Shirley Jackson."